More and more these days, smart phones, like the iPhone, are becoming central ways to pass along and receive information. Many productivity mobile apps help us to truly, for the fist time, communicate in a nearly paperless exchange. Thus, it seems natural that in the coming years, we will less paper business cards, that typically get thrown in a desk drawer, and instead use mobile devices to send and receive contact information.When you think about it, there’s little point of traditional business cards, for when you send or receive them, the information has to be manually entered in a computer or mobile device if it’s going to be of any future use. Not surprisingly there are a few great ways to send contact information via your iPhone. Let’s check them out. Perhaps the quickest and easiest way to send business contact information via SMS is by using your existing contact information in your iPhone’s Address Book. Select “Share Contact” at the bottom of your info card, and it will create a SMS with your V-Card attached. The recipient of your “card” can open and add your contact information to his or her Address Book. Most modern digital address books accept v-cards. You will probably want to create more than one v-card about yourself in your Address Book—one for personal contact, business, and other activities. While the v-card method is efficient, it’s not the most elegant way to send contact information. As the old saying goes, images speak louder than words. A free iPhone app called uMe (pronounced you-me) can put a face, sort of speak, to your contact information. You can select and deselect the contact information that you want to include in on a card. Your company’s logo or personal photo can be added to the card. 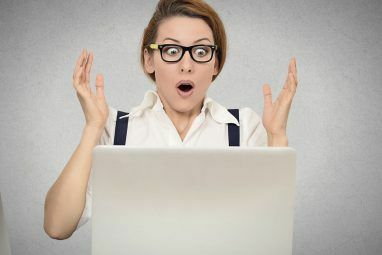 The biggest limitation to uMe, however, is that you can only send to a recipient’s email, or post it to your Twitter page. It would be great if you could also send it via SMS. SnapDat is another free business card apps that allows you to create custom cards and send them via email, Facebook, and Twitter. SnapDat does not provide SMS integration either, but it does include a wide variety of template designs—or you can add your own. 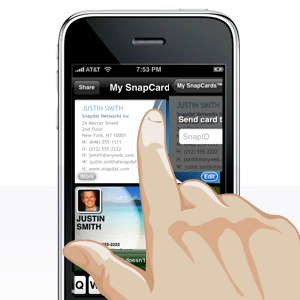 Your SnapDat card is formatted and sent both as a JPG file and a v-card for downloading. 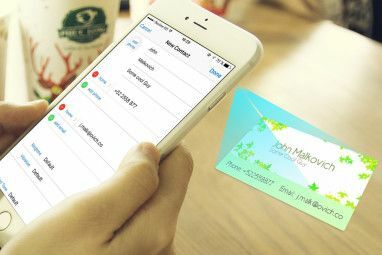 It would be even better though if the contact information, such as the phone number and web address, on SnapDat cards could clicked from with the email itself, in addition to the v-card. 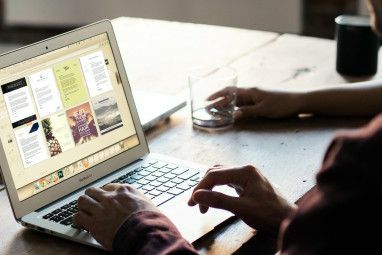 Digital cards are not widely used yet, but these and other mobile apps represent the possibilities for what can be done. Let us know what you think of these free apps, and how often do you use v-cards in business interactions. For other MUO articles about virtual business cards, start with these articles. Explore more about: Business Card, Business Technology. Jose, that looks pretty interesting. I'll give it a try. Thanks for your feedback. Americacube, not sure if understand your message.